You guys remember not too long ago when movies like Transformers and The Dark Knight took their sound design and score off the deep end of the bass spectrum with the warbles and the throbbing? That hasn’t changed much, as Godzilla sometimes reminded us, and it’s about to get a lot more thumpy with Michael Bay’s Transformers: Age of Extinction, because EDM superstar Skrillex is coming to the party. Well, I guess now is when we can officially start referring to it as a party. There admittedly isn’t really a whole lot to delve into as far as his involvement is concerned, but it’s known that he’s working on the film’s sound design, and that he is “creating the craziest Skrillex sounds I could ever make.” If you’ve ever listened to Skrillex’s music, you know that he’s already capable of making some pretty unique sounds. (You might even call it “noise,” depending on how high you wear your pants.) So to consider him doing something that could safely be called the Skrillexiestest thing in existence is kind of intimidating to those not wanting their eardrums numbed. But then again, one would expect nothing less from Michael Bay. I’m kind of surprised that he hasn’t just invented a real Transformer by this point. Finally, Transformers: Age of Extinction has given me a phrase to latch onto that demands more attention than Mark Wahlberg’s doe-eyed faux-clamation, “I think we just found a Transformer.” I’m much more into this “If you see something, say something” campaign driving the film’s viral website TransformersAreDangerous.com. The smear campaign is very broad and on the nose, mind you, but I like the fact that they’re building up what’s transpired in the time between Dark of the Moon and Age of Extinction. As someone who isn’t bursting with excitement for Michael Bay’s next entry in this franchise, I do find my interest in it is building. I love something that can be referred to as howl-worthy. Shying away from ridiculousness like fire-breathing robot dragons, the video above and images below build on mankind’s aggression against the Transformers, who are totally responsible for the mass destruction of Chicago. Seriously, I would quickly turn my back on these guys, too, if one of them made a crater out of Wrigley Field. The video would have worked so much better had Robert Stack been able to do the voiceover, ending on a creepy Unsolved Mysteries vibe. 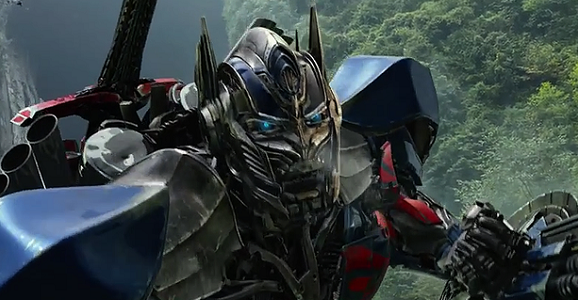 In the wake of the giant monster action of Gareth Edwards’ rebooted Godzilla, the giant robots of Michael Bay’s Transformers: Age of Extinction are gearing up to stomp into theaters. Set to kick off a new trilogy for the multi-billion dollar franchise, the film is now back with a trio of new TV spots that you can bet you’ll be seeing soon all over primetime and during large-scale sporting events. These videos are a bit of a move in a different direction for the Age of Extinction marketing team. What we’ve seen so far has been almost completely action centric, and while there is still quite a bit of that, these three videos all reel things in a bit in order to focus on a the darker tone and the human side of things. But don’t worry, there’s still footage of Optimus Prime brandishing a sword, riding on the back of Grimlock, one of the Dinobots. Attention all cosplayers, you now have two options in front of you. First, you can step up your game—and we’re talking way, way up—or you can just flat out quit. Why would we make such a statement, you may ask, because this guy in his Transformers costume, just totally won. By a mile, or a landslide, or whatever cliché you want to use. Any way you care to look at it, this is going to be hard to be beat. See, his outfit actually transforms. This guy was spotted in Ann Arbor, Michigan, where his antics delighted some young passersby. In fact this 30 second video is already much more engaging and entertaining than Michael Bay’s giant mech movies. Maybe I’ll just watch this for two hours instead of going to see Age of Extinction. Not only is this guy dressed like a Bumble Bee from the series, but when he flips his lid, the robot actually converts into a car and rolls around. The design is relatively simple, but the end result is exactly what you want out of a costume, and maybe even a vehicle. Michael Bay’s latest foray into the world of giant shape shifting robots, Transformers: Age of Extinction, may be the movie I’m most curious to see this summer. I’m not a fan of the previous three movies in the franchise, though critical drubbings have never stopped them from being hugely profitable. The more we see of this latest offering, supposedly the start of a brand new trilogy, the more absurd it appears, but that also makes it look like it could be pretty damn fun. This new footage ups the ante even more and you can’t help but wonder what the hell was going through Bay’s head as he made this movie. This new video debuted last night during NBC’s singing competition show The Voice, and is ostensibly designed to introduce a new song by Grammy-winners Imagine Dragons. I guarantee you’ve heard them before, whether you know it or not, over the past year their song “Radioactive” has been in every single movie trailer, it was almost impossible to escape.